The health sector is California’s most extensive and its workforce needs are changing—sometimes very quickly. John Cordova is the Sector Navigator for Health for California’s Community Colleges and Statewide Director for the Health Workforce Initiative. We caught up with Cordova recently to find out what’s new in his sector and what the community colleges are doing to help meet the workforce needs in health care. The health sector is a critical component of California's economy—the largest sector. Give us a sense of its breadth. When one thinks of the health sector, you often think of predominately hands-on patient care professionals, such as doctors and nurses. But the health care sector is much more. When you look at the continuum of care, there are multiple levels of health care delivery in addition to hands-on patient care. 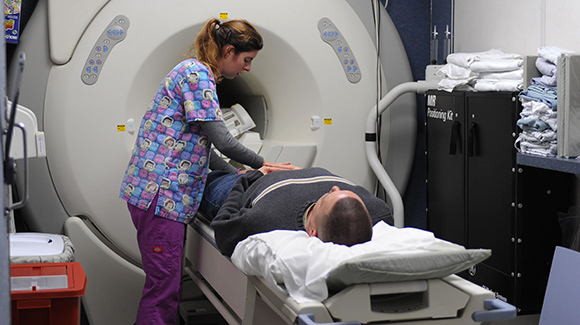 Imaging and diagnostics, health informatics, and population health, public safety, and emergency medical services; rehabilitation, mental/behavioral health care services, and public health are all areas in demand. The California Future Health Workforce Commission (2019) reports there is a grave shortage in the California health care workforce and will create a significant disparity for many people to gain access to the care they need. For example, the report shares “in the next decade, California will face a shortfall of 4,100 primary care clinicians, will need an additional 600,000 home care workers, and will only have two-thirds of the psychiatrists we need.” This deficit will intensify within rural communities and communities of color. Inland Empire, San Joaquin Valley, Los Angeles, and most rural areas are already suffering from a tremendous shortage of qualified and diverse workers. The need for delivery of health care services will also increase in community and home care services, with new roles, skills to match the distribution to cost-effective and quality health care. There will be a need to increase the capacity of programs, with the increase of baccalaureate programs. California’s Community Colleges and Universities must be nimbler and more collaborative in education approaches for co-enrolled programs to meet the entry-level and postgraduate level workforce. What are employers telling you that they need from the community colleges for workforce development? In 2016/2017 we had more than 165,000 enrolled in health-related programs with more than four out of five of them attending part-time. The emerging needs for the workforce are more competency-based and short-term education. Large health care organizations are seeking to upskill their current workforce. The need is an open entry, open exit type of training for incumbent workers. Workers generally need to continue to work as they train or upskill; they have families and financial responsibilities to maintain and cannot decrease work hours to go back to school. We see more demand for online and onsite delivery from industry so that workers can work and educate at the same location. Some employers are even providing incentives such as financial, child care and release time to seek educate. What successes are you having with employers already—and how are students benefiting? Our deputy sector navigator for the Greater Sacramento area has great engagement with employers. Nursing specialty programs have been developed with health care organizations to upskill nurses in areas such as labor and delivery and emergency room nurses; both engaged with community colleges as the training partner. Employers are seeking to work with the community colleges via contract education or non-credit courses. Further, employers are opening doors to host off-site locations to serve their workforce but the community better. We are becoming better at meeting industry needs and demands, but there is more work to do to meet entry-level and middle skills jobs and competencies through programs. We know that early learning opportunities—internships and other real-world experiences—are a priority. How is that effort going? Nursing and allied health programs all have built-in internships, preceptorships as part of the program requirements. Much different than apprenticeship models. The Department of Consumer Affairs has been tasked to look at earn-and-learn models in health care and, more importantly, what the challenges and barriers are. Some of these findings will show that professional accreditation bodies do not allow students to be paid while in these preceptorship programs. There is a lot of activity to see how apprenticeships can work with colleges as the training component. Work is currently in place with certified nursing, medical assistant and paramedic exploration for apprenticeship. Collaborating with the Department of Apprenticeship Standards, the California Community College Chancellors Office, Strong Workforce Apprenticeship Group, Workforce Development Boards, Employment Training Panel, Community Colleges, and Industry are developing models in earn-and-learn, pre-apprenticeship, apprenticeship, and apprenticeship-like models. Looking forward to the next year, what are the challenges and the opportunities in your sector? A big challenge is funding. Nursing and allied health programs are the most expensive programs in career education at the colleges. There are programs actually on hiatus across the state for multiple reasons including lack of qualified faculty to teach in the programs and need for program directors. Faculty salaries are not comparable with industry pay. With a critical need for a trained workforce, it’s frustrating for both employers and the colleges that we can’t produce faster. Curriculum revision and or new program development takes time for approval. Pilot program funding is needed to help colleges implement programs in newer delivery methods, such as hybrid and online education, rarely seen in the health care sector. Other challenges include saturated markets with enough graduates in a given profession or graduating enough for maintenance, or the most significant is the decrease in access to clinical sites for student rotations. It is becoming difficult to place students in required clinical rotations to meet graduation requirements from approved programs.